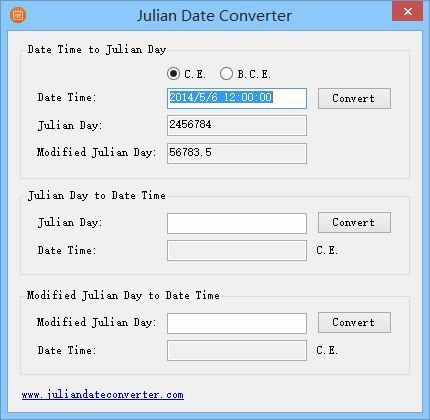 Julian Date Converter is a free date conversion and calculation software for Julian Day, it can quickly convert Date Time to Julian Day, or convert Julian Day and normal Date Time. Software can support Modified Julian Day. If you often use Julian Day in your work or life, this small software will be an effective utility on your PC desktop. 1. Convert Date Time to Julian Day. 2. 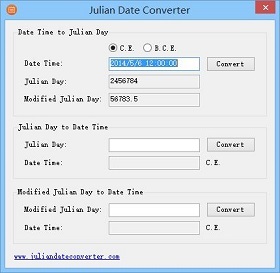 Convert Date Time to Modified Julian Day. 3. Convert Julian Day to Date Time. 4. Convert Modified Julian Day to Date Time. 5. Freeware, free to use. Software can support date CE (Common Era) and BCE (Before the Common Era). Julian Day (JD) is the number of days elapsed from the "January 1, 4713 B.C., 12:00:00" (JD 0), this value can facilitate days calculation, such as the interval between two dates, the total number of days for some events and so on, so it is widely used by astronomers, historians and etc. As sometime Julian Day have too many digits, the International Astronomical Union (IAU) simplified it as Modified Julian Day (MJD), which is defined as "MJD = JD - 2400000.5". Modified Julian Day appropriate starting point "November 17, 1858, 00:00:00" (MJD 0). Copyright © JulianDateConverter.com, All Rights Reserved.